Have you ever had a certain vision or image in mind or a design or pattern in which you think things should happen or unfold only for it not to remotely resemble what you envisioned? It can be frustrating and deflating, but do not let the detour deter the dream! The beauty of dreams are that they are organic, fluid, ever evolving, and just because they may start one way, it is not unusual for them to take an alternate route. What so many of us miss is the beauty and message discovered in the detour. A detour does not necessarily mean you have been knocked off course, but instead reveals another way in which to reach your destiny. A detour is not a dead end! You may have a usual route you take daily to and from work. After awhile, your vehicle could pretty much drive itself home. It becomes bland, mundane, and unadventurous. But now there is construction or an accident and you have been detoured and forced to take an unfamiliar passage. Although this new direction is foreign, it yields its own perks. You get to see new parts of the city, come across new establishments, and because it is new, your every sense is titillated, soaking in the fresh and fascinating scenery. Same with life. Sometimes in life we get knocked off course for one reason or another or without rhyme or rationale, the course simply changes. Do not let the detour deter the dream. Although the road you traverse my change, it is the journey that should be cherished. Destiny is not determined by where you start, so no matter where you start or which roads you travel, your destiny is married to your willingness to withstand and continue on no matter where the roads lead. Enjoy the detours life present. They offer us all an opportunity to experience new things we may have otherwise missed, to see new outlooks, and to learn alternate ways to reach our destiny. Detours also shield us from harm and protect us from unknown mishaps. Our detours remind us to be patient and to soak in the journey, not overlooking or ignoring the paths we travel or taking for granted the experiences that help us to grow. Remember, the detour does not deter the dream; it develops the destiny! WOW is all I can say! Thank you BrotheWord for helping me to be appreciative for the DETOURS! So many nuggets and jewels that blessed me! “The most fulfilling adventures happen when you start your journey without knowing where you’re going, because only then are you free to experience the unexpected detours you’re meant to take.” ~ A.J. Darkholme – This right here alone speaks volumes and has gotten me where I am today in life! WOW! 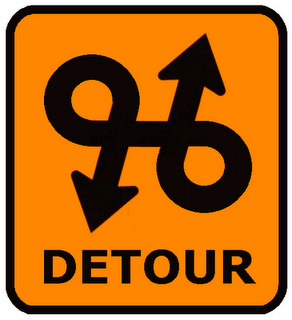 Detours… I love this! It really speaks to me. I use to get really upset when things did not go my way, but now I just take it with a grain of salt. Now I know for sure that God has my back. If I have a detour, I just take it. It is only temporary. His word is true, He will never leave you nor forsake you.